I was back in the STUDIO on Sunday afternoon to commence filming new VIDEOS for the next PLINTHS release. Myself and Mr J Dredge gathered in Theatre Deli in Broadgate to do filming for TWO (2) films. We only really needed to do ONE (1), for the next single which should be out in March, but I knew that we are SO EFFICIENT that we usually only use the first hour of our two hour bookings, so we worked out something else to do if that became the case. SPOILERS: it did. The first video we did was for the song "Pancake Day". I've wanted to do a DANCING video for AGES, ever since The Knees In My Legs watched the video for What Is Life by G Harrison and LOVED it. John and I discussed what we could do, with the initial idea that we'd have John doing simple dance moves, and make it look like there were three of him doing them at the same time. However, once we got started I realised that a) this would be really difficult and b) it looked GRATE with just him doing it on his own. It may surprise you to find out that I am NOT a professionally trained DANCE director, but it turns out that watching several series of Strictly and going to CHARLESTON lessons about a decade ago is all the training I needed to stand there saying "PLACE your hand! STRAIGHTEN your leg! Marvellous darling!" It may also surprise those who know him to find out that John is NOT a professionally trained dancer, but once we got going he WENT for it, and looked GRATE. We did a whole bunch of different moves which we'll cut together, and I fuly expect "Pancaking" to take its place alongside "Dabbing" and "Flossing" at all of next season's high society balls. After that we did some stuff for a song called "Idiots Rule The World". The idea for this was to film John's face singing the song, so I could superimpose it over some ACTUAL idiots who rule the world. To enable this I had bought some sheets of green paper from the Art Shop at work, and we spent some very happy minutes cutting a hole out to fit John's FACE. 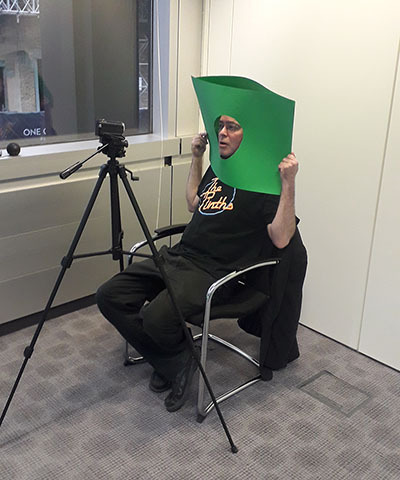 This left a gap around the sides, so we stuck another sheet across the back, making a rather marvellous Personal Green Screen, as seen below. Watch out Andy Serkis, there are new Special Effects Experts in town! To make it work properly I ended up stood behind John, holding the side of the sheets with one hand and shining the torch from my phone down the back with the other, to try and keep it all the same shade of green, which I feel made John look like the SECOND daftest person in the room. I was very glad the the windows along the sides of the room were FROSTED! When I got home I had a quick check to make sure that this had actually WORKED, and was amazed and relieved to find that YES, it actually had! There will now follow several weeks of tinkering with both videos before we UNLEASH them on the public, but hopefully this blog will serve as a Behind The Scenes Documentary TEASER until then!